Keith Fitz-Gerald's expertise is in identifying market patterns others don't see and in finding opportunities that are – as of yet – unrecognized. Both can give you a powerful edge. So when he first spotted the X pattern, Keith could hardly believe the results. And in his 34 years in the markets as an analyst, consultant, and quantitative trader, he'd never seen anything quite like it. So he spent six months building a treasure trove of research into winning trades. And no matter how many times Keith ran through this information – and no matter how many times he had his team try to find an “exception to the rule” – they couldn't. One that stayed hidden until very recently. This first X pattern has appeared in two to three of these stocks a month… each and every month. You could've been rewarded with a constant stream of high, triple-digit winners. Even gains that soared well beyond 1,000%. That's why he's so excited to share his findings with the public for the very first time with his brand-new High Velocity Profits. 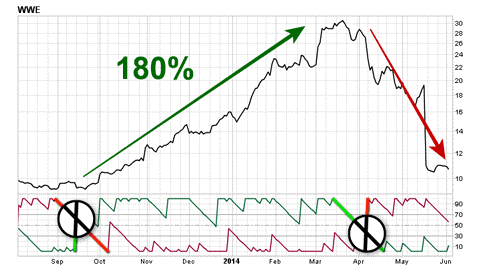 Keith believes this simple pattern will allow you to, with 100% certainty, only buy stocks that are going up. You will, with 100% certainty, only buy stocks that are going up. And sell them when you see it again. This is a nine-month stock chart for World Wrestling Entertainment – the $900 million sports media company. In September of 2013, WWE's share price began an aggressive rise. And the following April of 2014, it started to plummet – eventually landing fairly close to where it began. Now earnings reports, countless financial statements, and even product launches would explain WWE's rise and fall. Because all you need to know are two dates. Look at September 15, 2013. The green line in this chart shot straight up and the red line fell. As they crossed, they formed an X. Shortly after, the stock surged 180%. Then, on April 4, 2014, it happened again. 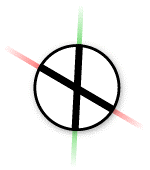 Another X formed, as the red line shot straight up and the green line fell. And look what happened next – WWE dropped like a ton of bricks. Your reward would've been a 180% windfall in about six and a half months. Let's jump back to 2009, and you'll see this same story play out with Netflix. On August 7, the green line shot straight up, as the red line dramatically fell. The first X was formed. 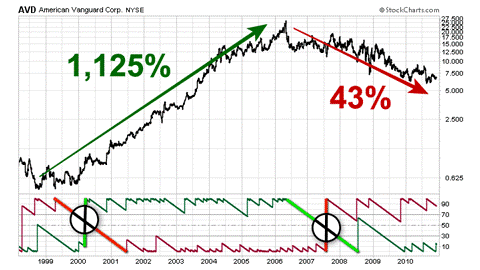 On August 5, 2011, after Netflix's stock had jumped 420% – the red line shot straight up, as the green line fell. As they crossed, the second X appeared. And over the months that followed, Netflix's stock crashed 65%, wiping out the majority of the gains. From boosts in subscriber counts and increased revenues, to overhype and rising costs of securing content – there was no shortage of factors driving Netflix's wild ride. That 420% winner would've been yours for the taking. Let's rewind back even further to the year 2000. Here's a chart for the agricultural products company, American Vanguard Corp. – ticker AVD. And what do you see on March 16, 2000? That green line shooting straight up as the red line falls. And there's the first X. At the time, American Vanguard's stock was trading for $1 a share. And when the second X appeared on July 31, 2007, it had hit $12.25 – representing a gain of 1,125%. Somebody looking back could've provided a long list of reasons for American Vanguard's multi-year rise. Because, before any of these things came to pass, that first X had appeared. And if you had bought all the shares you could get your hands on when it did… then sold them when that second X arrived… you would've pocketed that 1,125%. And you would've been free and clear when, shortly after, American Vanguard's stock dropped 43% to only $7 a share. These three examples dating from today all the way back to the millennium represent a quick snapshot of something amazing Keith Fitz-Gerald has uncovered. It's going to change how you see the markets – and how you invest from this day forward. It will first appear in two to three stocks a month, every single month. Shortly after that X forms, oftentimes within 24 to 48 hours – the stock shoots up. And as the charts show, there's a second X pattern. The stock begins to pull back. You would've won on 100% of these trades. You would've never lost. 7,476% on Monster Beverage Corp.
2,566% on Kingold Jewelry Inc.
As incredible as this X pattern is on its own... it's not the ultimate answer. Now the X pattern achieves optimal performance when it's matched with the right caliber stocks – high-caliber stocks. When it first appears in high-caliber stocks, those stocks quickly enter into a state of high velocity – unleashing an unstoppable explosion of profits. To identify a high-caliber stock required another unique discovery from Keith, one that's just as simple as the first. It's called the F-Score – an incredibly precise metric for uncovering public companies whose share prices are susceptible to enormous profit spikes. Pocket a non-stop series of windfalls that average out to gains of 164.68% each. And it took Keith – a former member of the Wall Street fraternity – to uncover this powerful new pattern. This remarkable discovery is at the heart of his brand-new High Velocity Profits, now available to the public for the very first time. We've all looked at stocks in the past that we wanted to buy. Did I just miss the boat? You absolutely… positively… did NOT miss the boat. In fact, the real profit explosion is about to begin… because these stocks have reached a state of high velocity. These Xs have delivered quick-hit payouts… these Xs have produced long-term winners… and this same X pattern has appeared alongside the biggest windfalls of the last 15 years. High Velocity Profits uses Keith’s proprietary analysis reveal a unique (and powerful) combination of momentum and value indicators. And when the unique X pattern occurs, Keith provides detailed recommendations so you only buy stocks that are already going up. 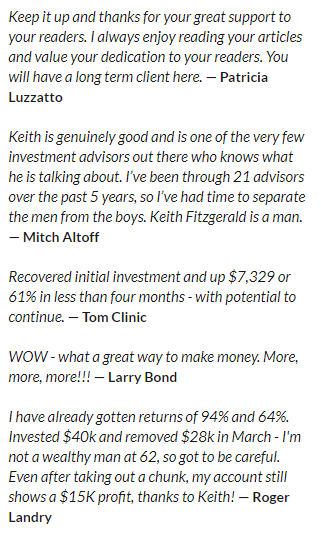 Forbes magazine called Keith a “market visionary.” His insights and analysis are regularly featured on FOX Business, CNBC, and CNBC Asia, as well as in the pages and on the websites of Bloomberg, The Wall Street Journal, WIRED, Forbes, and MarketWatch. High Velocity Profits delivers winners by identifying stocks that meet two critical factors. 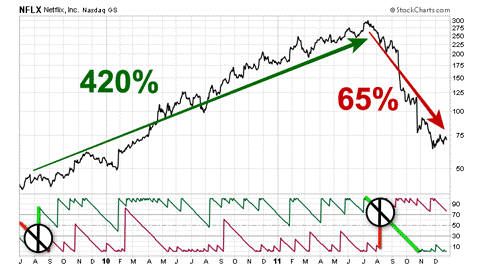 This pattern allows you to buy stocks that are already going up and to sell when stocks are about to move down. 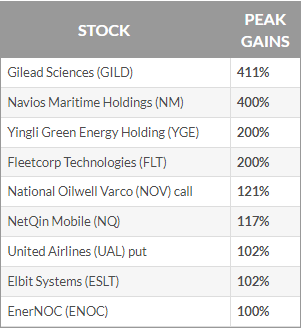 The High Velocity Profits Portfolio focuses on stocks that are already going up. Currently, each core position in the High Velocity Profits portfolio is profitable. Go here for immediate access to the High Velocity Profits portfolio. Go here for immediate access to High Velocity Profits Alerts. The High Velocity Profits library includes special reports, audio and video tutorials, and Keith’s recorded videos of recent TV appearances on well-known investment shows. Go here for immediate access to High Velocity Profits Research Reports and Investor Briefings. To help his High Velocity Profits members understand exactly how the X pattern works, Keith has prepared a series of video tutorials. You’ll learn exactly how the key indicators work, the best way to decide the size of your investment and the signal that shows it’s time to exit with your profits. Go here for immediate access to High Velocity Profits Media.